I have received samples to facilitate my post. All thoughts are my own. Of course, we all know it is important for kids to maintain a great oral care routine. We tell them to brush their teeth, and brush them for them before they are big enough to do it themselves. We limit the amount of candy, or soda, or gummy things that they eat. We take them to the dentist. And we really hope that we are getting everything done, the right way, so that the kids can have nice healthy teeth. I know from experience that sometimes all of those things are just not enough. We have always taken care of the kids teeth. but my kids suffer from teeth that are way to close together. The teeth are packed very tightly in their mouths, that the dentist have often told me that at some point we will have to think about braces and possibly removing a tooth to make room. And while my kids teeth look fantastic from the outside, those teeth being so close together has actually caused us problems. 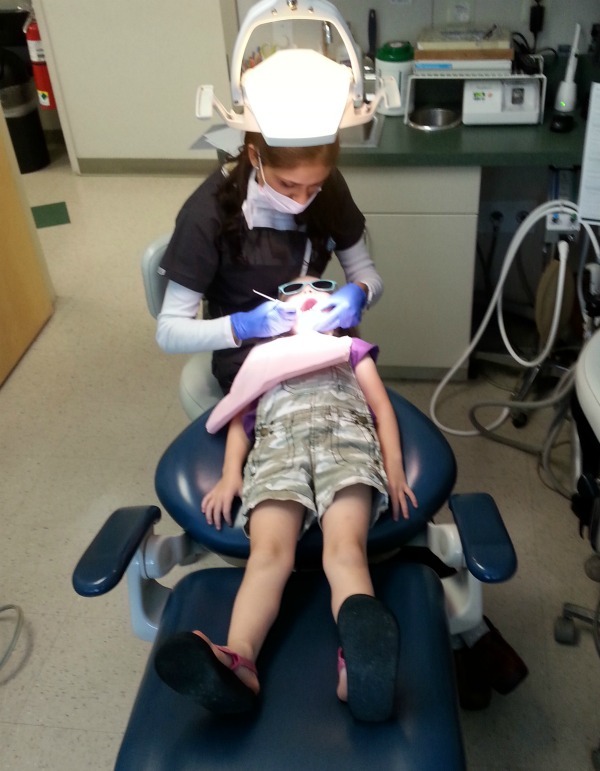 Over the summer, my youngest went to the dentist for the first time. I was so proud of her as she sat in the chair and opened her mouth wide for the dentist. The dentist actually went on and on about how great her teeth looked. She did the initial exam and said that there was very limited tartar, and that there was no sign of decay. She did notice that her teeth were extremely close and tight together. But since Willow was sitting so well for ht dentist and following all of the instructions so well, she wanted to go one step farther and take x-rays. This is where the problem came in. After the xrays were developed, Willow had 8 cavities. All between her teeth. We decided that the best way to fix the problems, without causing a fear of the dentist, was to do them all at once, while she was asleep. It would be an easy procedure and since she would be asleep, there would be no pain and nothing to cause her fear in the future. So while we have always brushed her teeth well, we have added a few more steps into Willow’s dental routine. Fun tooth brushes: I really believe that kids will brush longer, without complaint, if they have a tooth brush that they love. My daughter loves Hello Kitty and when she knows it is time to brush, she gets excited to break out her Hello Kitty tooth brush. This Hello Kitty brush from FireFly offers a 1 minute timer, which we turn on twice, for when it is time for Willow to brush. 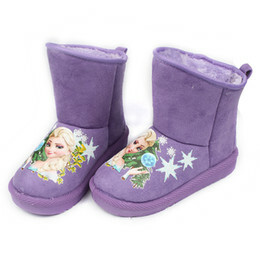 The design of the brush is perfect for the size of Willow’s mouth and it is a perfect brush for any little girl. Firefly offers lots of characters, so even if your little one is not a Hello Kitty Fan, there is a character to encourage your kids. Dental Floss: Even if your child, or you, do not have teeth that are close together, it is so important to floss. While we have flossed the kids’ teeth, I will admit, I was not as adamant as I should have been. I always got frustrated trying to get my big fingers in their small mouths to get the floss between the teeth. A great way around this is to get the dental floss picks. These make it so much easier to get into their mouths. As they get a little older, like Willow is now, they can even do it themselves. We try to carry them with us even when we are out, since they often come in resealable bags, because then Willow can use them after every snack and meal. Even when we are out. Mouth Wash: I never thought that it was very important that my kids used mouth wash. I figured it was much more for breath than anything else. Recently I learned that it is very important. Mouth wash helps remove plague, germs and food particles that might have been missed with brushing. It will also help get those bits and pieces out from in between the teeth. Again, because that can be such a big problem. 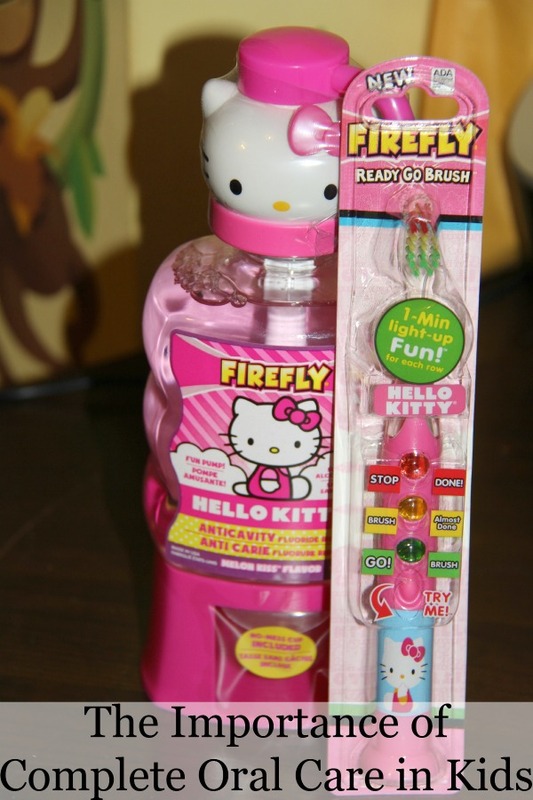 Firefly has a matching Hello Kitty mouth rinse, in a yummy bubblegum flavor, that will really encourage the kids to swish the solution around their mouth. It is sugar and alcohol-free and has fluoride. Brushing 3 times a day: I know that they say that we only need to brush 2 times a day. But one thing I have noticed with kids, even when we brush for them, it is very hard to get all of the food off of their teeth. That is partially because kids eat often, but also, their mouths are so little and the kids are wiggley that is is just hard. By adding in another brushing session, kids learn just how important it is to brush well, and you can feel a little better about getting everything. Have you ever had to deal with your kids have dental issues? What are your tips?